Last month, we saw the launch of large variety of GSM-based Windows phones like HTC HD2, running Windows Mobile 6.5. However, we didn’t see many Windows phones coming in for CDMA users on carriers like Verizon as some of the Android phones like Motorola Droid. 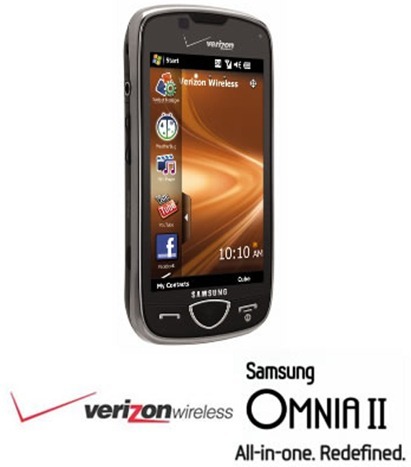 And now after much delay, CDMA version of Samsung Omnia II has finally landed today on Verizon Wireless. The Omnia II has a 3.7-inch WVGA AMOLED display which has now pretty much become a standard for Samsung’s high-end smartphones. Samsung like HTC, has gone deep in skinning Windows Mobile 6.5 to make it more finder friendly. With no physical keyboard available, you will have to rely on the virtual QWERTY keyboard with Samsung’s Swype entry method. Swype is easier and faster way for continuous one finger, or stylus motion across the screen keyboard. The Omnia II also has a 5-megapixel auto-focus camera with flash, video recording and on-device editing capability like the iPhone 3GS. You also get the speedy Opera 9.5 enhanced browser, access to Samsung’s Widget Store (free widgets to customize your home screen) and DivX and Xvid video file support. It has WiFi, Microsoft Office Mobile, FM Radio, rear stereo speakers, 3.5mm headset jack, 8GB of internal memory, 1500mAh battery, and supports microSDHC memory cards of up to 16GB in size. Omnia II is reasonably placed at a price tag of $199.99, after a $100 rebate with a 2-year contract on Verizon Wireless. Will Omnia II be attractive enough on Verizon from Microsoft’s perspective to keep new customers drifting away towards the more popular Android-powered Droid phones? Let us know what you think about Omnia II in the comments section below. You can follow us on twitter or join our facebook fanpage to keep yourself updated on all the latest Windows phone releases. The Windows Mobile 6.5 smartphone also has advanced multimedia features, Wi-Fi, 3G support, Bluetooth, and GPS. Swype is developing for the Android platform with many more devices to come in 2010. Also, Swype is different than ShapeWriter and functions more accurately. You should try Swype out and see for yourself! I just bought Omnia 2 last week.Im impressed and satisfied with Omnia 2 performances.Smooth and beautiful interface. samsung omnia 2 sometimes didn't response but when it comes to windows mobile it really looks great.